To celebrate Mtn Dew’s arrival in Atlanta for Dew NBA 3X, an elite 3×3 basketball tournament in six cities across the USA, Green Label is spotlighting the art, creativity, and culture of ATL, including a complete court takeover by ATLien Greg Mike. Shortly after college, Josh Goldenberg moved to New York City from a small town upstate and began freelancing as a graphic designer. Under the moniker of “Glassface” he and high-school friend Rahil Ashruff began spawning visuals for acts such as OG Maco, Ab-Soul, DJ Premier, and Royce da 5’9”. As their portfolio grew, they found themselves on the radar of many up-and- coming artists, like when Lil Yachty reached out on Twitter. This is how the duo made headlines last week with their kooky Lil Yachty collaboration “1 Night,” which featured kittens, karaoke, and all things tragi-hip in 2016. 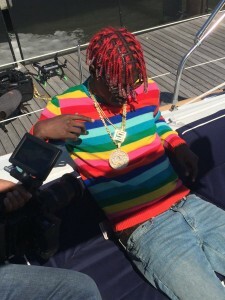 Yachty allowed them to do “whatever,” Glassface says, his only request being to include his homie doing the super fast dab. With the goal of making “very meme-able and GIF-able material,” he went for “sensory overload,” including multiple layers of images, in all different mediums. The whole thing only took a day to shoot and about two weeks to edit. We got Glassface’s advice about making a memorable music video. My definition of a successful video is something that pushes the art, makes people react or feel something—creating something that will stand the test of time. This is my best advice. Too many creatives do free work to get exposure, build their portfolios, or to pay dues. Creativity has value and anyone coming to you for work knows that. I usually write pretty broad treatments. They give you constraints, which are good for art, but they’re broad enough to allow for improvisation. When I edit, I definitely let sporadic ideas and art come into the visual. I think showing bits and pieces of the creative process, within the visual, can make it more interesting and give it more depth. For me, I think it helps that I have multiple specialties, in that I’m able to better execute any creative idea I have. I can write, shoot, direct, edit, VFX, add my own art, etc. A lot of people say to choose one thing and become the best at it. My goal is to do that with every art form that interests me. It can be a burden sometimes so it definitely helps to collaborate with people who can add to your skill set.